In my latest book, What’s the Future of Business, I introduced the Ultimate Moment of Truth, that moment where people who convert an experience into discoverable content in any one of the countless social platforms people use to stay connected these days. 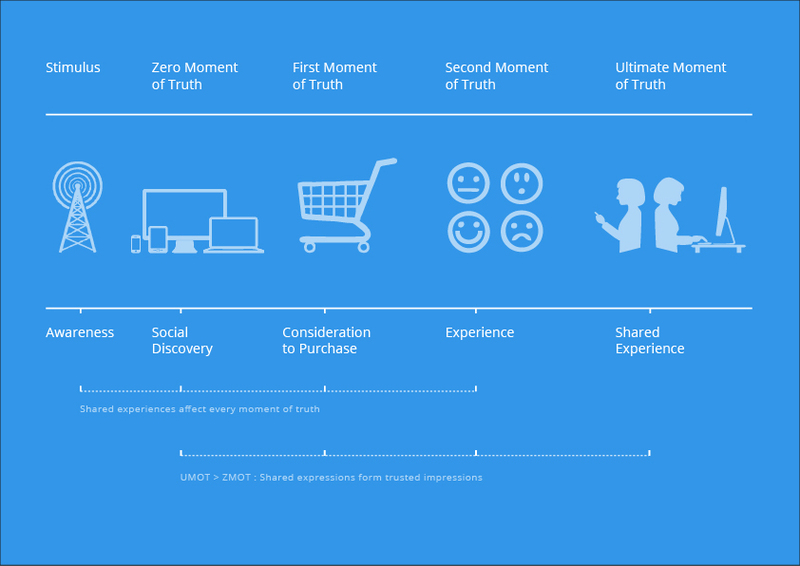 And in this connected economy, the Ultimate Moment of Truth, or UMOT, becomes the next person’s Zero Moment of Truth, over and over again. First impressions matter. They matter to people and they especially matter to brands. At Google, we’ve taken a long look at how, increasingly, first impressions are formed online and have a big impact on what we decide to buy. We call this online decision making moment the “Zero Moment of Truth,” or ZMOT for short. 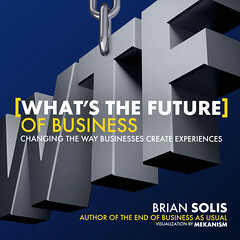 In his latest book, What’s the Future of Business: Changing the Way Businesses Create Experiences, Brian Solis, a principal analyst at Altimeter Group builds further on ZMOT’s implications. He zeroes in on how consumers’ first impressions of a brand often come from fellow consumers sharing experiences online. The accumulation of these shared experiences, Solis says, means brands need to pay more attention than ever to customer experience, journeys, and the relationships they nurture. An interesting perspective. As a student in social media, I am fascinated by the data and human perspectives developed through interaction with technology. Thanks! I completely agree with what you say about making it an experience. Its all about building relationships with consumers so a purchase is more than just a one time thing. Great points! Agreed! Although you are certainly branding yourself and your company, you’ve got to maintain that delicate balance of keeping everything personal. Make it seem like you are speaking directly TO individual customers. Most brands still focus only on the transaction part of engagement forgetting that it really is an endorsement of the previous two, viz, Action and Reaction. The most powerful takeaway – “The information included on web sites isn’t written for you an me, it’s written for the person approving it.” Mobile changes that, and how! Great piece. Thanks. Solis’s article makes a critical point and provides an apt warning to us online marketers about the pitfalls of today’s technology in the world of digital marketing: We must not forget to relate our digital strategies to the underlying human element that drives consumers & their behaviors online. The age of big data & online metrics, finely tuned to each social media platform across devices, makes it easy for marketers to become preoccupied with digital strategies for SEO, while loosing sight of the fundamental human instincts that determine how consumers actually behave online. Today’s consumer is conscious of the Internet’s transformation into a selling tool, and has learned to be discriminating of information sources & their agendas so much so that their methodology for obtaining info has changed completely. Now, vetted & trusted members of their social networks become the first line of inquiry rather than “Googling it” for contemporary consumers. This evolution in the consumer search process marks an upheaval for previous SEO strategies. Now that social networks often initiate consumers’ first brand interaction, the consequent click-thru path will differ and we marketers must account for these changes. Solis reminds us that keeping in mind the human aspect (consumer motivations, instincts, & social cues) of the online experience will help better pinpoint how users choose to interact with a brand, enabling marketers to accommodate for this in their online campaigns. What a fantastic comment. This should be a post on its own. Thank you. First impressions are everything. With the internet taking over, we must realize that the ability to share these first impressions can be done instantaneously. Instead of just sharing through word of mouth, these can be posted anywhere…Twitter, Facebook, etc. Once these experiences are shared through these networks, that’s when they start building. Companies should keep in mind your points about being personable with consumers, as that increases positive brand talk. Thanks for your post- thoroughly enjoyed it! Thank you. And I must say that I thoroughly enjoyed your comment. Great post and concept Brian, thanks for sharing. have a negative experience can do the same. have shared their experiences is helped if there are programs to encourage it. huge impact in terms of customer loyalty and lower cost of customer acquisition. I really enjoyed reading this post because it stands as a reminder that connecting with consumers is more than just counting shared content and exposure–it’s about tapping into your audience’s emotional connection to the brand. In this way, companies and organizations can create a lasting relationships with their consumers. All too often, it seems that companies are too focused on the bottom line. In other words, they think too short-term. While it is certainly important to meet the bottom line (and exceed it, if possible), it’s more worthy to create a relationship with the people who use/buy your product or service. I think companies should be thinking further forward. Brian: I loved how you described the importance of a positive first impression. This applies at all times, but especially when it comes to brand loyalty. In my own experience engaging with brands on social media, I’ve found it to be largely beneficial. In talking directly with brands through Twitter, I’ve connected with several people who share my interests. And when I read or share brand content through social media, it’s usually in a positive light. However, I do see a good amount of negativity online about certain brands. As far as first impressions go, I personally would trust what a friend or family member says about a brand, and that would definitely influence my loyalty to that company/organization. What would you say is a good way for companies to go about addressing these first impressions? Should they reach out to them directly or smooth it over with other types of promotions (i.e. contests, giveaways, etc.)? Overall, great post! As a graduating senior of PR, I loved reading your professional standpoint on brand loyalty and first impressions. Thank you, Brian! Really? I have to stop by sometimes to confirm why I don’t follow you on twitter or read your blog. This is gibberish dude. You on mushrooms? Just asking. Do you know how little we share online? It is like 0.05% of our daily life. You are over weighting digital and dissing real life. Real life is where it is at. Real life off line is where most decisions are made. For example Pepsi. 39 million views not unique viewers….over a year. So maybe 20 million unique viewers? 25 Mil? and they have 3 bil customers. So not bad 0.8% of customers saw the spot. Pepsi needs to reach I bet 100 million a day in the US. Vs the 100k/day that you tube spot has. How many bought because of the spot? Unknown. Don’t overweight how many people loved the spot and watched it many times but never bought the soda. I shared maybe 1 of my 1500 experiences today. Added up among the many it looks great! Like the 25 mil posts on Facebook during last year’s Superbowl. Not bad. But that means probably only 3-5 mil of the 160 mil viewers shared on Facebook about the game. Not bad. But nothing amazing. Math kills marketing every time because marketers over value. You need to find the real value. All the branding in the world won’t help you if there isn’t some sort of engagement stemming from the branding process.